River Valley pitcher Baylee Hollanbaugh delivers a pitch during a March 28 softball game against Point Pleasant in Point Pleasant, W.Va. THE PLAINS, Ohio — A worthwhile battle to the very end. 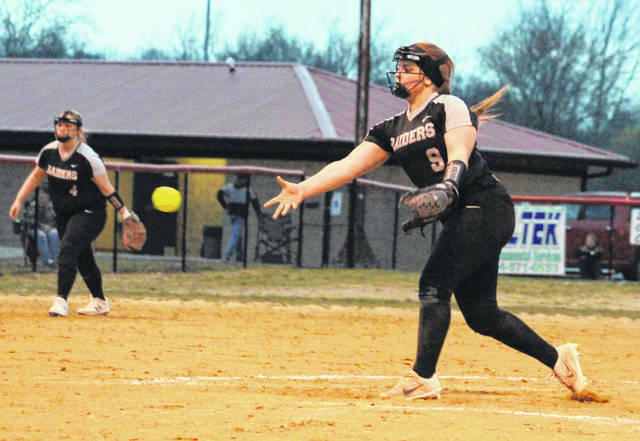 The River Valley softball team took its only lead on a two-run homer by Skylar Jones in the seventh and ultimately held on for a thrilling 4-3 victory over host Athens in a Tri-Valley Conference Ohio Division contest in Athens County. The Lady Raiders (4-5, 2-2 TVC Ohio) picked up their second straight league win on the road and have also won four of their last five outings. The Lady Bulldogs took a 1-0 lead in the bottom of the first as Tenoglia singled home Kaiser with one away, but the guests answered with a run in the third as Kasey Birchfield doubled home Jones to knot things up at one. Athens reclaimed the lead as Kish singled, advanced to second and scored on an error for a 2-1 contest through four complete. The Silver Black rallied to tie things up in the top of the fifth as Sierra Somerville and Baylee Hollanbaugh provided back-to-back leadoff singles, then Cierra Roberts doubled home Somerville for a two-all contest. Roberts delivered a one-out single to start the seventh, then advanced to second on a groundout. With two away, Jones deposited an 0-2 offering over the left field fence while giving RVHS its first lead of 4-2. Kaiser singled home Brannen with nobody out in the home half of the seventh, cutting the deficit down to a single run. AHS followed by grounding into a force out at second, then a fly ball to centerfield turned into an 8-3 double play to wrap up the outcome. The Lady Raiders outhit the hosts by a 9-6 overall margin and also committed two of the three errors in the contest. River Valley left eight runners stranded on base, while Athens stranded seven on the bags. Hollanbaugh was the winning pitcher of record after allowing two earned runs, six hits and four walks over seven innings while striking out five. Stewart took the loss after surrendering four earned runs, nine hits and three walks over seven frames while fanning six. Jones and Roberts paced the guests with three hits apiece, followed by Hollanbaugh, Birchfield and Somerville with a safety each. Jones drove in two RBIs and scored twice for the victors. Kaiser led Athens with two hits, followed by Stewart, Tenoglia, Kish and Toppercer with a safety each. River Valley faced Symmes Valley in a doubleheader Saturday and returns to action Wednesday when it welcomes Alexander for a TVC Ohio contest at 5 p.m.